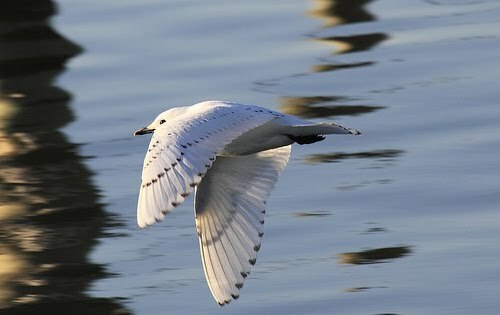 I became interested in seeing an Ivory Gull almost immediately after my new found obsession with gulls began. Somewhere along the line, I convinced myself that the next Ivory Gull reported in the lower 48 would have to be twitched. It finally happened! 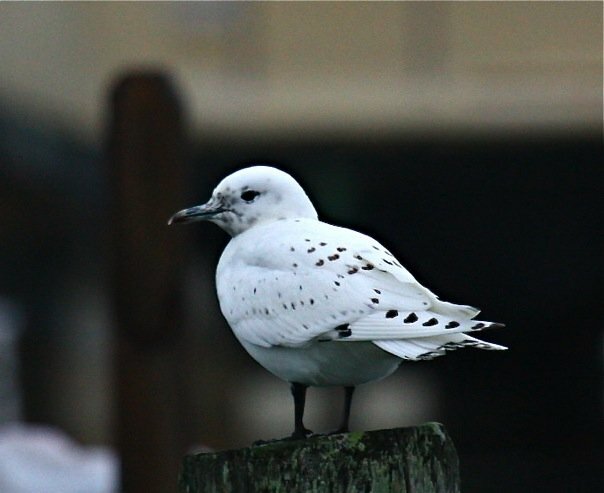 On 26 Nov 2009 an Ivory Gull was reported in Cape May, New Jersey and it continued to be reported daily for the next week. I had never been to the birding capital of the east coast and so this was one more incentive to take on this mission. I enlisted Bruce Heimer, the Gyllenhals and Wisconsin birder Chris West to join me in this epic twitch. The six of us met at my house on 4 Dec 2009 at 5:30 p.m., packed up, and we and hit the road. 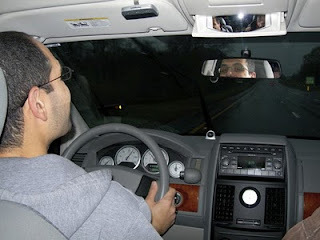 We were in my minivan and so naturally I began as lead driver. I felt not an ounce of tiredness and wanted to get to Cape May before sunrise on Saturday and so my foot started to get heavy. We had one minor setback--I got ticketed for speeding in Ohio (80 mph in a 65mph). No big deal, just Ohio bringing in the revenue. For some odd reason, I was determined to drive the rest of the way to NJ. I insisted on driving. I drove for 13 hours straight and got us there by 7:30 a.m. I should take a second to thank Bruce for buying me a 5-hour power-shot energy drink. It really worked! We were superbly pumped the enitre ride there - well almost the entire ride. About 45 minutes before our arrival, MI birder Allison Vilag texted Chris West explaining that she and her family were at the spot with no bird. 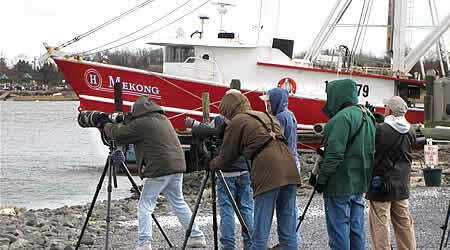 Other birders were there as well and they were all waiting in the rain. Suddenly, everyone in the car became nervous and pessimistic. One disgruntled birder even said, "Well, the bird has to leave at some point and maybe today is the day". The bird had usually been reported between 7:30-8:00 a.m and then seen for the rest of the day thereafter. We were still in the safe as far as the bird's usual time schedule but were rapidly approaching an irregularity which is never a good sign. We got there and the rain put a real damper on our arrival. I always keep a spare garbage bag in the car as a rain coat; I threw it on and got to searching. Bruce Heimer and I became restless and so we decided to search the north side of the marina. We left the immediate area where the bird was expected to show. We spent about 10 minutes searching with no luck when Chris West calls. I knew it was going to be good news when I saw his number. "Where are you guys, the bird is here?!". Sure enough, the bird showed up within the expected window. We ran, knowing the IVORY GULL wasn't going anywhere...but you never know! We arrived, out of breath, and the IVORY GULL was perched, in the scope, and the mission was accomplished. As I was approaching the scope, I felt as if I was going to be handed an honorary diploma. I took it in stride....ah, MY IVORY GULL! Eurasian Wigeon, Great Cormorant, Northern Gannet, Common Eider, Boat-tailed Grackle and American Oystercatcher. The drive home was a long and dreary drive. We encountered the first snow storm of the season in Philidelphia and it took us 2 hours just to get through the Philly-metro area. Oh well, it was well worth it. We got the Snow Pigeon! How did your obsession with gulls begin? For me it was this past summer when I found your blog and saw the post about the Ring-billed x Laughing hybrid (still the coolest looking gull I've ever seen). Hi, Anonymous. My fascination with gulls started when I was in college, before I was formally introduced to birding. Once I started listing and started thinking about things like Ivory and Ross's Gull the "obsession' really took off from there. Thanks for reading! I'm rather ashamed to admit that for several years after I started birding I still called them S--gulls and had no interest in them whatsoever. In the past year though, I have learned so much about them, and have realized that they aren't nearly as hard to identify as I had originally thought. Thanks for replying!